He is concerned about Russia's status in Ukrainian legislation. 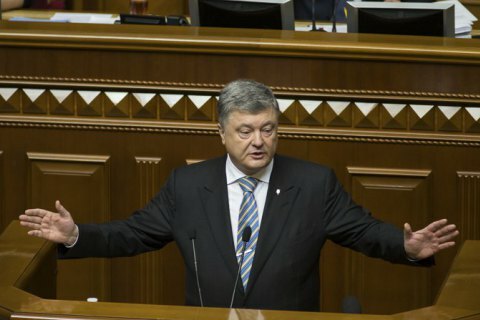 Ukrainian President Petro Poroshenko has instructed the Foreign Ministry to prepare a package of documents required to terminate the Treaty of Friendship, Cooperation and Partnership with Russia. "At last, being sufficiently prepared and legally protected, we have approached the termination of the Treaty of Friendship, Cooperation and Partnership between Ukraine and the Russian Federation, which has already become an anachronism, and it's Moscow's fault. In the near future, I expect to see the necessary package of documents from the Foreign Ministry of Ukraine," Poroshenko tweeted on 28 August. He also noted that Russia's status of the aggressor state is enshrined in Ukrainian legislation, and recalled the need to create a coordinating body for the formation of Ukraine's consolidated damage recovery claim to Russia.